1.125 IN. DROPPED DRIVESHAFT: The Mountain Cat’s increased track-to-tunnel clearance of 3" allows us to use 8-tooth drive sprockets on this model, giving you a flatter approach angle with more floatability and maneuverability. In addition, you’ll also notice a mountain of difference in your sled handling. 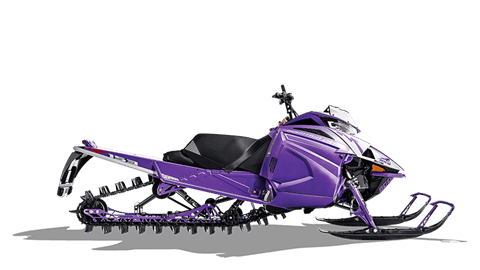 This update in the Mountain Cat delivers a more efficient power transfer to the snow, letting you enjoy more horsepower when climbing, carving, sidehilling and boondocking. The mountains are tough. Now you’re equipped to get tough right back. 153-IN. & 162-IN. POWER CLAW TRACK WITH 3-IN. LUGS: This lightweight, single-ply track with a 3 in. pitch sets the standard for deep snow performance. Stagger-set, curved-forward paddle towers won’t fold over. The new industry-leading 3 in. lug grips the powder like no other. Available in 153 in. and 162 in. lengths. VERTICAL STEERING POST, 4.5 IN. RISER WITH ADJUSTABLE MOUNTAIN HANDLEBAR: Want to counter-steer on steep hills? This 4.5" vertical post provides a more natural handlebar turning arc when you’re riding standing up. Estimated Dry - 457 lb.